Maple-Bourbon Apple Pie - Do You Know The Muffin Man? Notes: I was looking forward to a great tasting pie, but this one was just not very tasty. I made the double crust recipe with about three extra tablespoons of water. As a result, it was easy to work with, but came out quite crispy. The filling is made from many strong, competing flavours (candied ginger, pecans, bourbon, maple syrup, cinnamon) that don't blend together very well. It probably doesn't help that I misread the directions and dumped the full amount of cinnamon into the filling (rather than reserving some to make cinnamon sugar to sprinkle on top), as well as over-toasting the nuts. And, I forgot to sprinkle flour over the filling so had to do it after the top crust was put on. 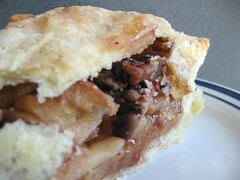 I'm beginning to think that simple is better for apple pies.